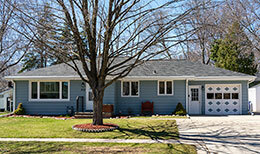 It’s still a strong seller’s market for most of the whole state of Wisconsin. All of Brown County continues to have low inventory but has increasing home values. SO, yay! For sellers. That’s a 9.4% increase from last year – that’s A LOT. Think of typical inflation, experts say on average inflation is about 3% per year. Well, for Green Bay, De Pere, and the rest of Brown County they rose up just over 9%! That leaves you with a 4.8% drop in the number of homes that have sold. What this means is that if no more homes for sale come on the market, this is how long it would take to have all the homes sold. The months of inventory of the housing market is a huge indicator to determine a seller’s market or a buyer’s market. This would show a seller’s market, for sure. The number of days on market are still dropping, which makes the whole house buying part even more stressful. You need to know what you want, make sure you’ve got your pre-approval letter from your lender handy, and be ready to strike when your next dream house pops on the market. Working with a buyer’s agent to get you in that door and ahead of the competition is a must!